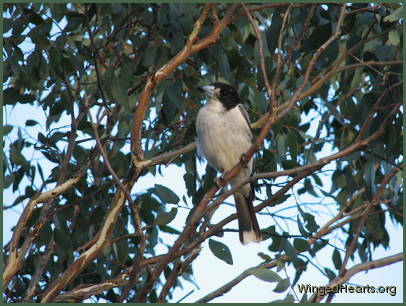 This is a picture of Larry our beautiful grey-backed butcherbird. 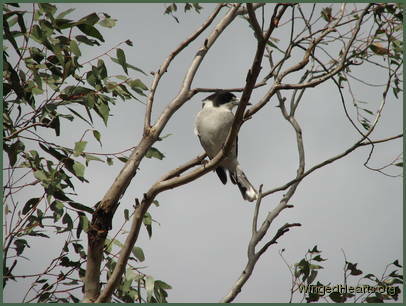 Grey butcherbirds are much smaller in size than their cousins the Pied-butcherbirds. The two species do not share the same territory. We first met Larry and his mate Harrie in July 2002. 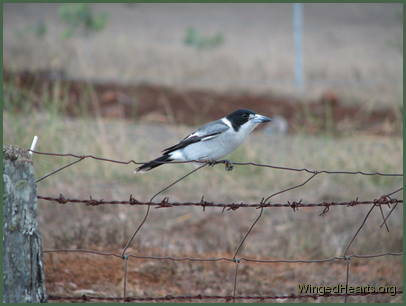 Maggie our magpie had brought his new queen Vicky to the paddocks below the hills where they formed their new breeding territory. 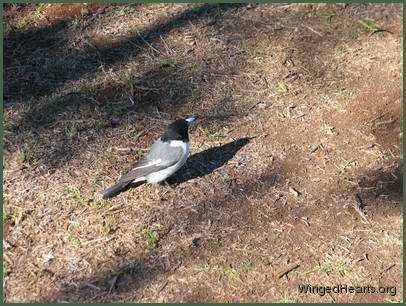 Magpie territorial rules prevented Vicky from coming to our yard, so once or twice a week we used to trek across the fields to see her. Larry and Harrie were Vicky's friends and would come with her to say 'hello'. Both Larry and Harrie were very friendly from the start. 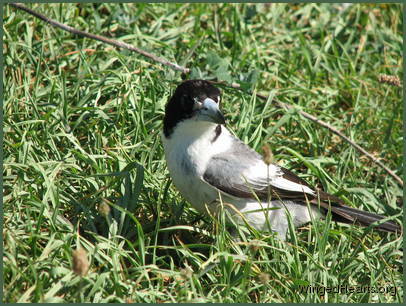 A few weeks later when the eggs in their nest hatched, they showed us their babies and loved us photographing them. One of their pictures is in the banner. Five clutches of their kids have grown up and visit us from time to time. These two birds have always been keen to demonstrate that food has never been one of their primary reasons for friendship. Often they take only the tiniest pieces of food, and each year they do not come to eat for several months. Yet when a snake was approaching us, Larry, whom we had not seen for weeks, appeared from nowhere and attacked the snake! Such a remarkable bird. 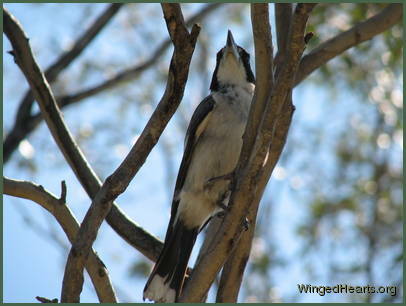 Even when they don't eat in our yard, they love to call us when they get the chance and invite us to visit their nest. 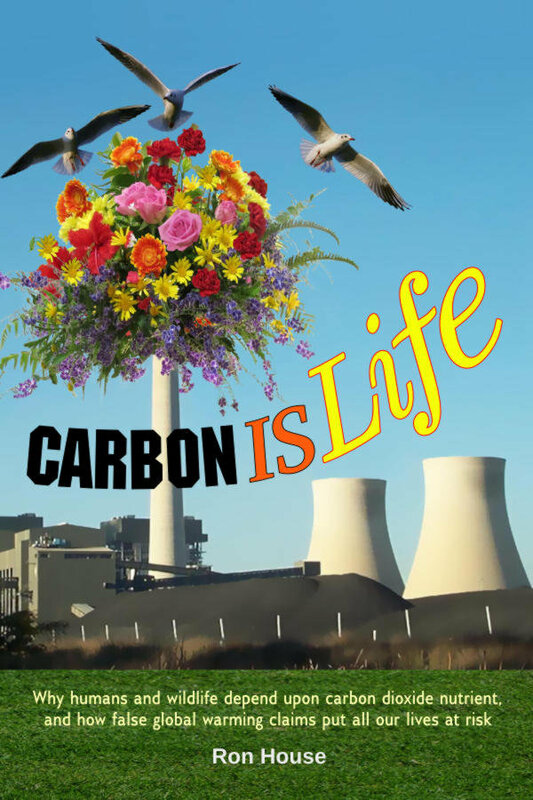 And when we do, there is no mistaking their excitement at having us visit and their gratitude towards us for making the effort. We will be sharing many stories about Larry, Harrie and their family. To view a slideshow of one of the snakes click here.